Chechen president: "Seek the roots of this evil in America." Thank you, Radio Free Europe, for the most timely Twitter list of recent vintage. They put up a story today on which “authoritarian leaders to follow on social media.” Among them: Chechen President Ramzan Kadyrov, who keeps up an active life on Twitter and Instagram. He’s chosen those forums to share his reaction to the news in Boston. Any attempt to make the connection between Chechnya and the Tsarnaevs, if they are guilty, will be in vain. They grew up in the United States; their attitudes and beliefs were formed there. It is necessary to seek the roots of this evil in America. The whole world must struggle against terrorism. We know that better than anyone else. We hope for the recovery of all the victims, and share in the sorrow of the Americans. They didn’t actually “grow up” entirely in the United States, having arrived around a decade ago, but points for trying. 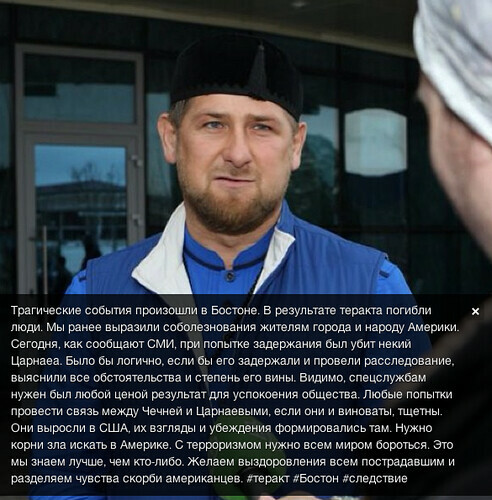 Kadyrov’s job is to shut down speculation that there’s some Chechen connection to what happened. Today, the media reports, one Tsarnaev was killed as [police] tried to arrest him. It would be appropriate if he was detained and investigated, and the circumstances and the extent of his guilt determined. Apparently, the security services needed to calm down the society by any means necessary. Read more on Slate about the Boston Marathon bombing.